Every image I make is deeply personal and is the result of an intimate relationship with these buildings and places. Finding the right subject matter takes hours of simply being in a place and trying to understand the feeling it evokes. Only then can I begin to see it in the way in which I can photograph it. I work to distill the parts of a scene that evoke the same feeling that I have being there. For me the visual and the emotional are one and the same. I can’t separate them. As I work with a scene I try to remove the elements that are not part of the emotion. This distilling of an image begins to shift it toward the abstract. The perfect image lies in-between simply recording the likeness of a place and the truly abstract. I think that photography is often viewed as more of a process and less of an art than other forms of expression like painting or sculpting. We, as photographers, borrow from nature and the physical world around us more literally. But the very objects and environments that give us our subject matter present obstacles that can make it very difficult to produce the images that we visualize. We are challenged to create a rich visual that is free from distractions and yet fully expresses our intent. All this must be achieved within the limitations of our medium. Throughout my work you will find architecture to be a dominant theme. Architecture provides subject matter where form is clearly divided into large, pleasing shapes, and tonality is carefully regulated by materials and lighting. It is the shapes and tones that I like to work with. I ask viewers to disregard the content itself and instead try to perceive the image as a whole. Think about the lights and darks. Think about how different shapes in the scene are balanced. Think about the softness and depth of the shadows and the subtle rendering of colors. It is this visual perception and interaction that I enjoy. Each of these images is a tiny slice out of time and experience which lies in between the ordinary parts of our lives. These are the moments when our thoughts are free from details and obligations. The moments when we are open to seeing more than just what is around us. These are moments which I find hold extraordinary beauty. I hope that as you view each of these photographs you will take a moment to see and feel what I have tried to capture and that you will take with you some of the joy that I have had in making them. in the May/June 2013 issue #106 of Lenswork Magazine. 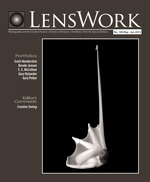 in the April/May 2010 issue of Lenswork Extended. in the March/April 2006 issue of Black & White magazine. in the January 1982 issue of Petersen's Photographic magazine.